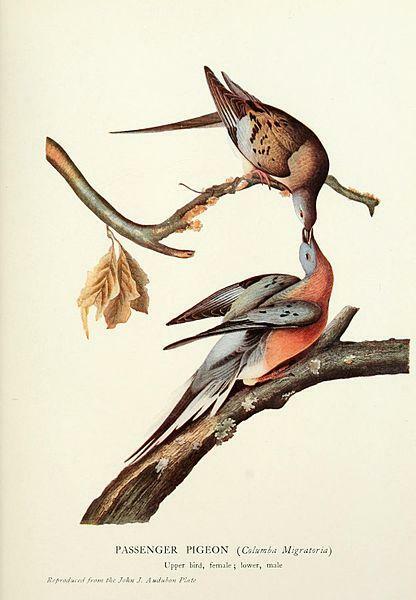 Zoological illustration from a volume of articles, The Passenger Pigeon, 1907 (Mershon, editor). As a biologist, I got a big kick out of Jurassic Park, a blockbuster movie that was released 25 years ago. The premise was basically bringing extinct species back to life using DNA extracted from blood that was drunk by mosquitoes that were subsequently trapped and preserved in tree sap. The pieces of information missing from damaged DNA strands was replaced with that of a living animal, in this case a frog, and was used to turn an unfertilized ostrich egg into a dinosaur egg. So why am I talking about science fiction dinosaur movies? Because I had this episode in the works for some time, and I wasn’t sure how to kick it off, but in all honesty the more I read about it, the more I can’t help but draw parallels to Jurassic Park. I am talking about the emerging science of de-extinction. However, the real-life application does not involve setting up a live dinosaur exhibit at a theme park; de-evolution is being looked at as a potential solution to environmental issues and challenges here in the U.S. and abroad. In Siberia, there is currently an effort underway to use herbivores to restore a desired habitat condition, a project called “Pleistocene Park.” There is currently an effort underway to bring the woolly mammoth back from extinction, using our closet living species, the Asian elephant. Closer to home, there is a project to bring back the passenger pigeon. Is it possible that Leopold was wrong, that we may yet again see these birds darken the skies? I’m trying to reserve judgement. I know just enough biology and genetics to grasp the most basic concepts here, especially when they supply colorful charts and illustrations. You can find plenty of details on their website, reviverestore.org. There is an extensive plan to bring this ambitious plan to fruition. basically, they want to re-create viable passenger pigeon DNA that they can inject into some eggs of band-tailed pigeons. Much like Jurassic park, de-extinctionists are obtaining DNA samples and in filling the gaps in the genome mapping using the DNA of a similar extant species, the band-tailed pigeon. They would hatch as band-tailed pigeons, but when they reached sexual maturity and bred, their eggs would be passenger pigeon eggs. The hatchlings would be raised in conditions that would allow them to breed more passenger pigeons, and let them learn to act like a passenger pigeon. Then when the population reaches 10,000 birds, they would start to release them in a couple of locations around the country and train them to migrate using trained carrier pigeons. A lot can go wrong with this process, but if everything goes right, de-extinctionists estimate we could have passenger pigeons released in test flocks between 2030 and 2040. I have so much I want to say about this concept, but I’m afraid it will have to wait. This is just a first peek at the de-extinction of the passenger pigeon. I look forward to additional discussions on this subject in the near future.